I've bought this product many times and previously given reviews over many years .. I'm still exceptrionally happy with the product, the price and the great service provided. Certainly will not go anywhere else to buy my protein powder. I have been using Professional Whey for at least 7 years! Their products and service is hands down the best. The Whey Concentrate is my favourite protein and will probably be using them for the next 7 years! I really enjoy this whey, it has no taste, which I love, and it helps me to recover very well after a big weights session. Love putting it in my smoothie in the morning too. Great product, well priced and exceptionally fast delivery. I love the fact that this protein powder has no fillers or sugars. It is just pure whey protein powder. It's easy to mix in smoothies and has a pleasant taste. It also has one of the highest protein amounts per 100g so it's a meal in itself! A truely awesome, clean, pure whey protein powder. I am very happy with this product. I've been purchasing this protein for years and will continue to purchase it for years to come. Very happy with the nutritional content, and it dissolves nicely with only a few shakes (no hidden powder clumps that ruin your day). I mix with additional BCAAs, ground cinnamon, and a flavouring. A very cheap source of good quick protein. I have used the Aus WPC for a number of years. Nothing on the market comes close in terms of pricing, quality and use ability. I recently converted a work mate to the product, he was blown away by the versatility and ease of use. 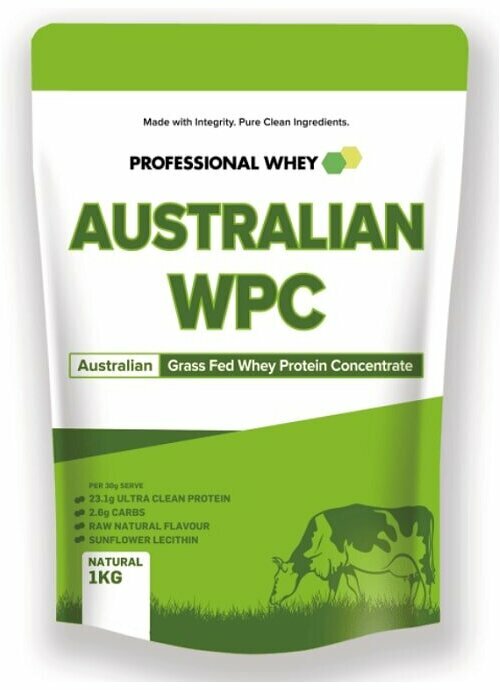 I have been buying WPC from Professional Whey for a number of years now. I love the fact that this is stripped back, doesn't contain any crazy ingredients and is fantastic value. I continue to recommend this to people and find they love it too. Why I choose Profesional Whey Concentrate. As an eighty year old, my aging body has a higher protein requirement than when younger and particularly because of my physical activity. I run up and walk down the steep river bank slopes of my property repeatedly, carry out chin-ups and pullups on my gym equipment daily, have had two trapeze lessons including a transfer and at least two more lessons coming up shortly. I have found Professional Whey ideal food supplement. It dissolves easily, tastes good in drinks, is good value for money and most of all, it helps me maintain a physical fitness of someone decades younger. Oh faithful servants of the Whey, let me express my profound gratitude for the careful skill and mindful attitude with which my precious milky white miracle whey was prepared for it’s journey. Good for health of older people. I've been using Aus Whey for 5 years, before that I was using another brand, downside of flavouring and sweetener. 30g/day on my cereal mix with 1 desert spoon of kelp granules. Professional Whey’s products are excellent quality at very reasonable prices, I recommend WPI to many, some listen. The reason I started using WPI was because I saw the massive improvement in my Mothers mobility during chemo treatment. She lost all appetitive and mobility; they gave her Sustagen which caused her mild diabetics to go wild. My sister came up with giving her WPI instead, within a very short time she was mobile again and gardening. Search https://www.ncbi.nlm.nih.gov/pubmed/ to check out the benefits for older people in particular. I've been using protein powders for over 20 years and the WPC for about 2 years and found it a high-quality powder that dissolves very well in water and mixing in aminos makes for an excellent pre and post workout drink. Love the fact WPC has no additives at all. It's an excellent product and I've been having it in a banana smoothie every day for several years. I am using AUS Whey to hit my protein macro each day. The product is low carb which is another plus. It mixes easily in a shaker and tastes very close to milk (with a bit of froth on top) Well worth a try. Good Value and can use it in cooking if you want to make protein bars, bread, cakes, quiche ect. Mixes well every time with water, guessing mixes well with milk too and tastes okay plain. Easy to add various flavours or fruits for a change. I am well into my eighties, and I think that I have more energy than most people my age, and I have a good report from the specialist on the condition of my heart. I can see some results after a month using this. I would definitely recommend it. A truly awesome product. Will keep coming back for more. Great cheap source of protein without unwanted sugars, flavours etc. Our WPC - Whey Protein Concentrate is now FREE of SOY LECITHIN. 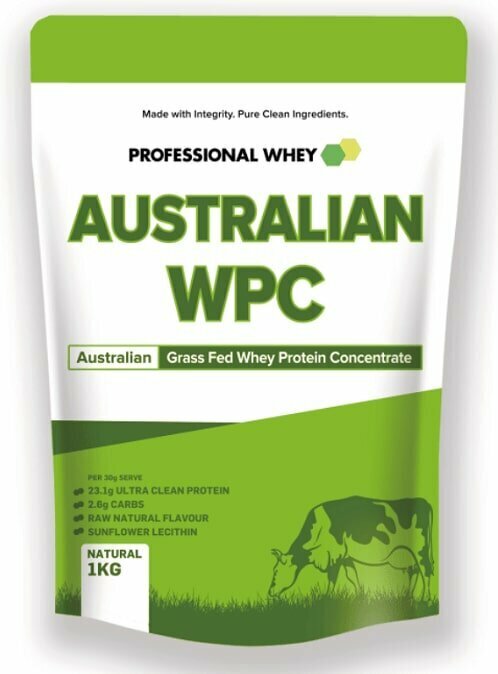 It is made from fresh cheese whey, that has been sourced from Dairy Cows which live on Australian Pastures and is our most economical protein powder and ideal for the health conscious. Ultrafiltration of our Whey Protein Concentrate ensures a high level of undenatured protein due to its low temperature processing. High Level of Undenatured immune boosting whey microfractions such as 44.5% Beta-Lactoglobulin, 19.3% Glycomacropeptide, 14.2% Alpha-lactalbumin, 4.6% Immunoglobulin along with smaller amounts of Proteose Peptone 5 and Bovine Serum Albumin. From Pasture Fed Cows that graze on the grass and clover pastures. High Protein at 80.9g per 100g on a dry matter basis. Low Fat at 4.5g of fat per 100g. Instantised to easily mix in water, milk & fruit juice. Aus whey protein is a great source of cheap easily digested protein. I have been using it for about five years and highly roeccomend it. It keeps me full till lunch time. I have it every day for breakfast and have lost 15 kg since I have been using this product. My Dietician put me onto it when I was suffering from stomach problems and told me to use 2 scoops each morning in milk. I also love the taste as it doesn't need anything added to it. I was a serial snacker till I found this product now I have to remind myself to eat lunch. I tell anyone that will listen how good this protein is best I have ever tasted! I like this product because it has not been heat treated. I have bought it many times. Pasture-fed is also important to me. It has a good flavour and is easy to use in a smoothie or on soaked flour pancakes with cacao powder, double cream and a little maple syrup. Love the products that Professional Whey put out. After trialing many inferior protein powders, I came across PW as they sponsor the ACT Brumbies, my favourite team. This one takes the cake because it can be mixed with literally anything, such as Weet-Bix, milkshakes, muffins, and cookies. It is ethically clean and contains nothing artificial. I have noticed faster and larger gains with this product than with any other powder. Also, when purchased in bulk it is considerably cheaper than many powders on the market. Cheers PW, you guys are awesome! Love the Aus WPC guys! First time using your powders. I find them very palatable and really like the fact that they are Australian and don't contain any additives. They are also very well priced. Being dairy farmers, we often work 13+hrs of physical work each day and its great to have a product created from Aus dairy that can replace more unhealthy snack cravings... Keep up the great work! It's clean and tastes alright when mixed with water. Only downside I found is without the soy lecithin (that is in Select WPC) it tends to froth when shaken and not mix as well. Although overall it is a great affordable protein with no additives. The most affordable, quality whey that doesn't make me too gassy. Easy to consume. Very happy. Have bought this quite a few times. I believe buying the 20kg bag WPC is the only way to go, you will never get it at this price per kg and will last years. No need for flavouring or sweeteners, mixes very well with water without it frothing up, great all round. I buy PW's 20kg MPI and do a 50/50 mix with the WPC, perfect! I have no idea why anyone would pay $60/kg or more for a big name brand when this one has it all: it's inexpensive, it's 80% protein, it's natural and doesn't have any fillers or other rubbish in it, it mixes well even in cold beverages, and you get a bulk discount. It's a no-brainer. I have been buying WPC protein powder for over 12 months & I will continue to buy this protein powder as I have found it taste good along with nourishing my body after a workout & it is such good value for money. Professional Whey offer an excellent trouble free service & delivery always arrives the next day even though they say allow 3 days. It's too easy. I can confidently say you will not be disapointed. I've had a lot of big name protein powders in my time but this prot stands head and shoulders above the rest! No strong flavour, great natural product, will be my go to from now on! Love the bulk order discount and quick delivery, never had an issue with customer service or product. Bulk savings to bulk up! Purchased the 20kg natural WPC powder – Great value. I have been using it every day. It’s easy to add your own flavourings such as coffee, vanilla or cacao. Pop it in your Nutri Ninja (or similar) and there’s no froth whatsoever! Suitable to blend with water or milk. Great in smoothies, pancakes, muffins, protein bites… No issues with ordering online -delivery was fast to Melbourne. This product is hard to beat! If you are looking for a Protein Powder where you don't find yourself questioning it's contents then this is the product for you! It really is flavorless making it perfect to add into breakfast shakes or for on the go. I recommend this product to all of my friends, clients and colleagues. I have found it to be the most cost efficient and effective product to keep up my daily intake. Professional Whey's deliveries are always fast and the products are packaged to a high standard. Many years ago when I became aware of how important it was to supplement with whey to encourage muscle mass, I went on a search for whey from grass fed cow. It was impossible to find whey from pasture fed cow in any of the retail shops. That’s when I went on line and found “Professional Whey”. Since then I have never looked back. Their service is impeccable and speedy always I chose “Professional Whey” for a number of reasons. I wanted to make an ethical choice, where animals have a life. I wanted a product that was shown to be much healthier than conventional whey protein. It has a much higher nutritious profile of omega 3 to 6 ratio and it has much higher vitamin E and beta-carotene to name a few. The big plus is that if you have food sensitivity or suffer from auto-immune diseases you can be assure that there are no GMOs or antibiotics present. I am a busy personal trainer, roughly do 30 - 40 sessions every week and I recommend professional whey products to every single client. These are the cleanest protein powders I have ever come across and I have tried most! I endorse all products from this company, and it is the only place I would ever personally buy my protein powders from. Thank you PW! I have been buying wpc and wpi for the last few years now. I trust it's ingredients and it has to be the best value product on the market. The combination of Aus wpc and good diet encourages me to train more often and with more intensity, which in turn encourages me to eat more cleanly and keep my protein intake topped up with wpc! A great situation to be in. The product is pure, no nasties added, from pasture fed cows. I have been using it for a long time and trust the product. It is also very economical and great price. Cheapest and best WPC out there. This is the raw deal of all WPC powders, this is what we need, we don't need extra flavour rubbish and any artificial crap. We drink protein shakes for protein, and this contains just that. Plus dollar for kilo is the cheapest out there.